Purpose: The non-invasive imaging and quantification of L-type calcium channels (also known as dihydropyridine channels) in living tissues is of great interest in diagnosis of congestive heart failure, myocardial hypertrophy, irritable bowel syndrome etc. 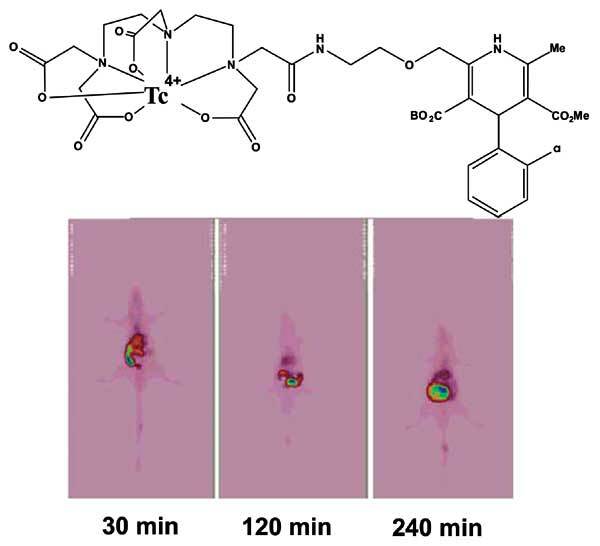 Methods: Technetium-99m labeled amlodipine conjugate ([99mTc]-DTPA-AMLO) was prepared starting freshly eluted (<1 h) 99mTechnetium pertechnetate (86.5 MBq) and conjugated DTPAAMLO at pH 5 in 30 min at room temperature in high radiochemical purity (>99%, RTLC; specific activity: 55-60 GBq/mmol). The calcium channel blockade activity (CCBA) and apoptosis/necrosis assay of DTPA-amlodipine conjugate evaluations were performed for the conjugate. Log P, stability, bio-distribution and imaging studies were performed for the tracer followed by biodistribution studies as well as imaging. Results: The conjugate demonstrated low toxicity on MCF-7 cells and CCBA (at µm level) compared to the amlodipine. The tracer was stable up to 4 h in final production and presence of human serum and log P (-0.49) was consistent with a water soluble complex. The tracer was excreted through kidneys and liver as expected for dihydropyridines; excluding excretory organs, calcium channel rich smooth muscle cells; including colon, intestine and lungs which demonstrated significant uptake. SPECT images supported the bio-distribution data up to 4 h.
Conclusion: significant uptake of [99mTc]-DTPA-AMLO was obtained in calcium channel rich organs. The complex can be a candidate for further SPECT imaging for L-type calcium channels. Keywords: Technetium-99m, amlodipine, Calcium channel blockade activity, apoptosis/necrosis assay, radiolabeling, Biodistribution, SPECT. Keywords:Technetium-99m, amlodipine, Calcium channel blockade activity, apoptosis/necrosis assay, radiolabeling, Biodistribution, SPECT. Abstract:Purpose: The non-invasive imaging and quantification of L-type calcium channels (also known as dihydropyridine channels) in living tissues is of great interest in diagnosis of congestive heart failure, myocardial hypertrophy, irritable bowel syndrome etc.